The Hurtta Extreme Warmer offers your dog extra warmth and protection during cold weather. The reflective foil inside the jacket reflects your dog's body heat. The winter coat is made from waterproof and breathable materials. The hood offers protection to your dog's ears. The Hurtta Extreme Warmer is a warm winter coat for your dog. This coat offers your dog protection even in the coldest circumstances. The inside of the Extreme Warmer is made from reflective material which reflects your dog's body heat to give the animal extra warmth. The outside of the jacket is waterproof. The jacket is designed to protect the dog's large muscle groups. It also has a high hood which can be lifted to protect the ears. The jacket also has reflectors to ensure visibility at dusk and night. What if the Hurtta Extreme Warmer doesn't fit? 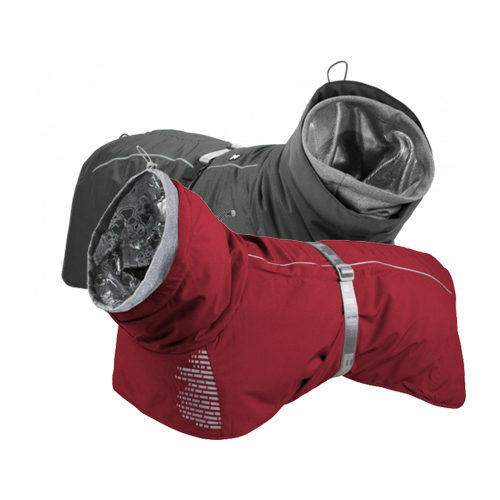 The Hurtta Extreme Warmer can be removed from the packaging and held up next to the dog in order to check whether the jacket fits. For hygiene reasons, the jacket cannot be returned if it has come into contact with the dog. If we find that the returned jacket is stained, worn, contains animal hair, smells or has been washed after use, we cannot return the product to you. In this event, it will be donated to a charity (local shelter). As we are often confronted with Hurtta Extreme Warmers that are returned in a less than new condition, we have to apply these rules for fitting and/or returning products. Have you used Hurtta Extreme Warmer before? Let us know what you think about this product. This beautiful coat has a nice snug fit and protects my Border Collie against the cold temperatures. I love that it's reflective as my doggy is now much more visible in the dark!